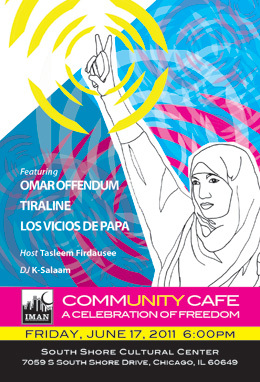 Come explore the powerful role of music and artistic expression in movements for justice as IMAN dedicates Community Café: A Celebration of Freedom to freedom fighters across the globe. Tiraline is an R&B group from Morocco that fuses traditional Middle Eastern beats with elements of pop and hip-hop. The four young men who comprise Tiraline formed their group in 2004 out of the Moroccan city of Safi, and since that time their music and global recognition has continually grown and evolved. Los Vicios de Papá is a high energy Latin ska fusion band with socially conscious lyrics and an enormous fan base in their hometown of Chicago. Their unique sound was born out of Chicago’s love for ska and roots reggae music. The group has toured the U.S. sharing the stage with some of the biggest names in Latin ska music. Tasleem Firdausee is a multidimensional spoken word artist, singer, writer, actor, radio host, activist and fashion designer who is also very active in women and children’s rights. She draws from her experiences growing up on the south side of Chicago, her faith and travels. She is an alumnus of Columbia College in Chicago where she studied Theater and Fashion Design. Community Cafe is supported in part by the Doris Duke Foundation for Islamic Art and One Chicago, One Nation.